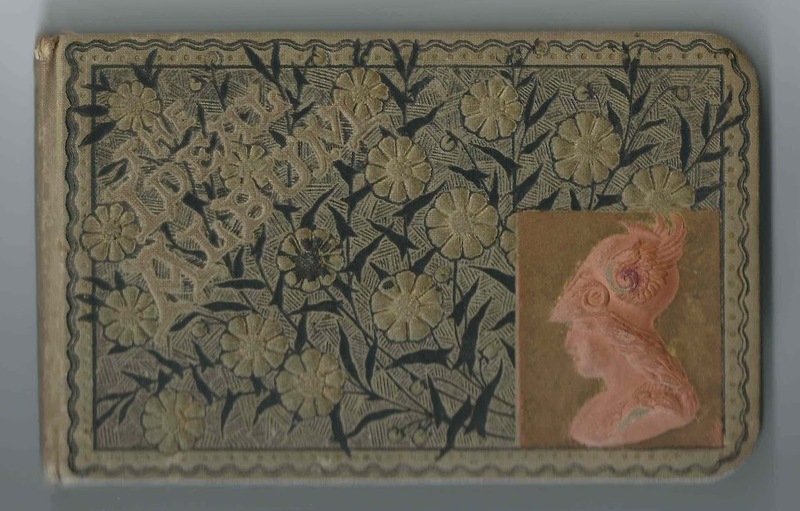 1878-1895 autograph album that may have belonged to Etta Bell Pierce, or Etta Belle Pierce, of St. Johnsbury, Vermont. Several people in the album mentioned family relationships, but, I believe some of these relationships were in-law or step relationships. 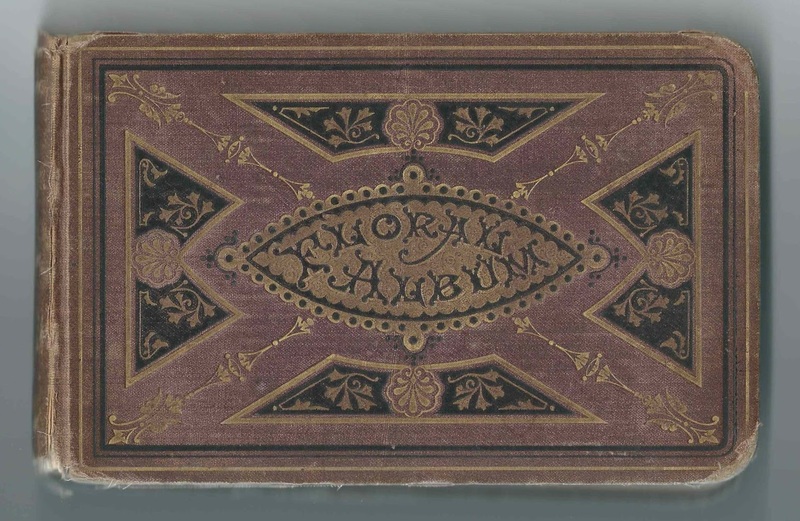 The album is approximately 7-3/4" x 4-3/4" and contains the sentiments of 65 people, including members of the Pierce, Williams, Bradley and Hallett families, members of whom indicated a family relationship with the album owner. An alphabetical surname list and an alphabetical list of the signers, together with any personal information they offered, appear at the end of this post. 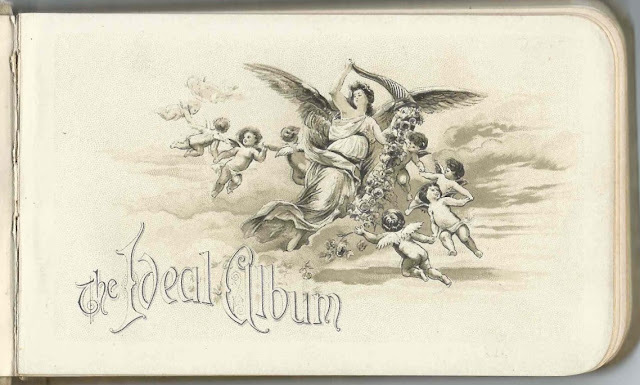 My theory is that the album belonged to Etta Bell Pierce, or Etta Belle Pierce, who was born October 14, 1867 at St. Johnsbury, Vermont, the daughter of Abel Allin Pierce and Rosetta (Ayer) Pierce, themselves both born at St. Johnsbury, Vermont. The A. A. Pierce who inscribed a page on October 14, 1879, was presumably Abel Allin Pierce. Rosetta had died by that time. The C. S. Pierce of Minneapolis, Minnesota, who signed a page at East Barnet, Vermont, on March 3, 1885 and called himself "your little brother", was presumably Charles Sumner Pierce, born November 6, 1859. Abel Allin Pierce's sister Jacynthia (Pierce) Bradley, second wife of Darius Bradley, signed a page on August 9, 1883 and called herself the album owner's aunt. Jacynthia's step-daughter-in-law, Nellie C. Bradley, wife of Elon Darius Bradley, and at least one step grandchild, Minnie Calista Bradley, also signed pages in the album. Another of Etta Bell Pierce's brothers was Edmund Carlisle Pierce, who married Mary L. Williams, daughter of George S. and Louisa (Willey) Williams and sister of Kate S. Williams, who married George F. Hallett. 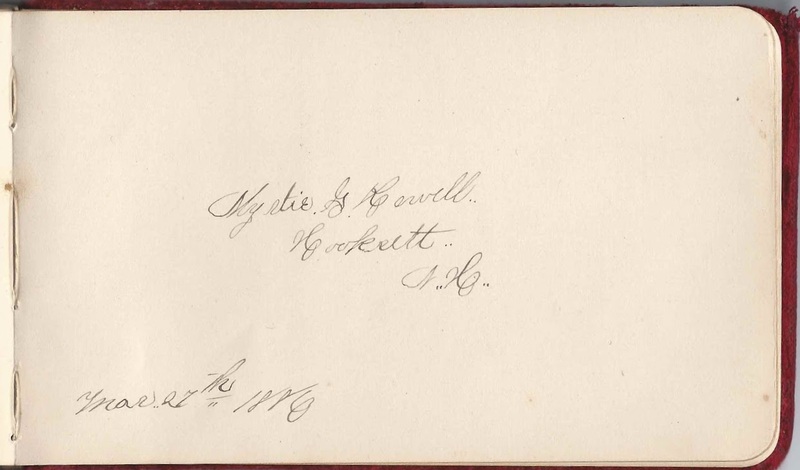 Mr. and Mrs. Williams and their daughter Nell M. Williams of St. Johnsbury, Vermont, signed pages in the album. Nell called the album owner a sister. George F. Hallett also signed a page and called himself the album owner's brother. 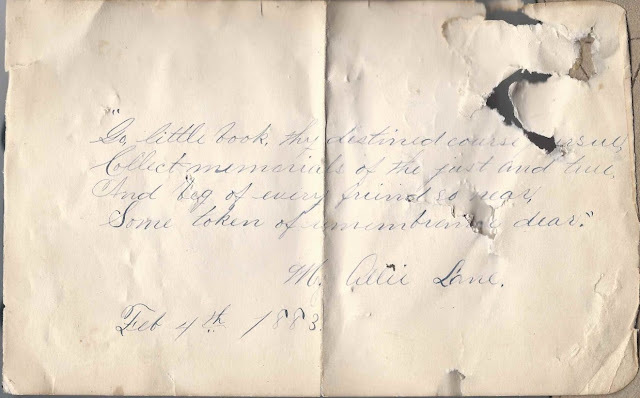 Someone, possibly Etta Bell Pierce herself, wrote the name Lettie on one page and "Little Sister Lettie" on another. I believe Lettie was Lettie Viola Pierce, daughter Abel Allin Pierce and his second wife Sarah (McGrath) Pierce. Lettie, born May 29, 1879, died young on October 8, 1882. See the face of an angel here. On February 12, 1891, Etta Bell Pierce married Pliny Worcester Chase, son of Amasa and Emma (Skinner) Chase. Pliny was born 7 March 1869 at Sheffield, Vermont. Etta and Pliny lived at St. Johnsbury, Vermont, and at some point moved to Brattleboro, Vermont. They had at least two children, a son and daughter. If you have corrections and/or additions to the information above, a theory as to a different album owner or information on any of the signers listed below, please leave a comment or contact me directly. Thanks! M. C., signed on February 16, 1879. Aunt Jacynthia P. Bradley, signed on August 9, 1883. She was Jacynthia (Pierce) Bradley, second wife of Darius Bradley; daughter of Abel and Mercy (Allin) Pierce; and sister of Etta Bell Pierce's father Abel Allin Pierce. Minnie Bradley, signed at St. Johnsbury, Vermont, on August 5, 1883. "Your Loving Cousin". She was the daughter of Elon D. and Nellie C. Bradley. Elon was the stepson of Jacynthia (Pierce) Bradley, second wife of Darius Bradley. Jacynthia was a sister to Etta Bell's father Abel Allin Pierce. Nellie C. Bradley, signed at St. Johnsbury Centre, Vermont, on August 9, 1883; album owner's cousin. She was the wife of Elon Darius Bradley, stepson of Jacynthia (Pierce) Bradley, who was the aunt of Etta Bell Pierce. Henry E. Byron of St. Johnsbury, Vermont, signed on April 2, 1882. I believe he was Henry Edmond Byron, whose wife Florentine Adelaide (Martin) Byron signed the right facing page. Mrs. Henry E. Byron of St. Johnsbury, Vermont, signed on April 4, 1882. She was Florentine Adelaide (Martin) Byron, whose husband Henry Edmond Byron signed the left facing page. Orrin Chamberlin of St. Johnsbury, Vermont, signed on March 2, 1882. His wife signed the right facing page. Mrs. Orrin Chamberlin, signed at St. Johnsbury, Vermont, on March 2, 1882. Her husband Orrin Chamberlin signed the left facing page. Lizzie Cook. Her name is on a calling card that is inserted into slits in the page. Mrs. E. E. Gagnon of Lyndon, Vermont, signed on February 12, 1880. Presumably Lizzie (McMullen) Gagnon, wife of Elmore E. Gagnon. She wrote what appeared to be "Gognon", and I did find an instance of that spelling in the records, but usually the records used the Gagnon spelling. 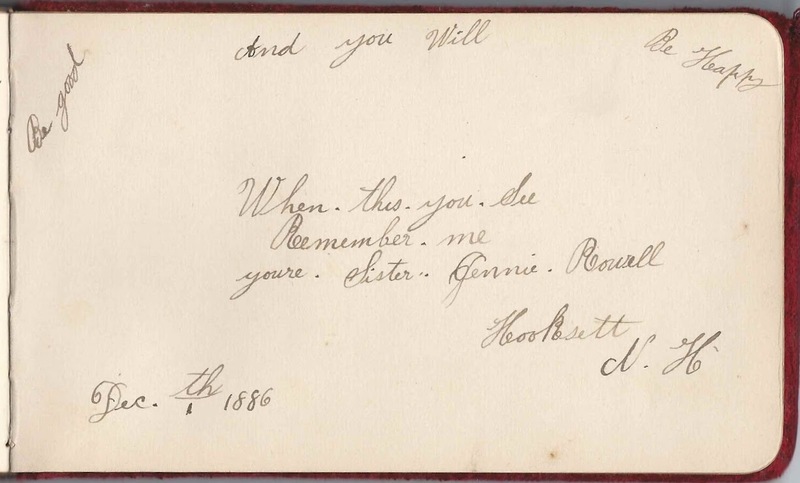 George F. Hallett of St. Johnsbury Center, Vermont, signed on March 21, 1879; "your brother". He married Kate S. Williams, whose sister Mary L. Williams married Etta Bell's brother Edward Carlisle Williams. Nellie S. Hancock of St. Johnsbury, Vermont, signed on November 28, 1878; "after a Thanksgiving dinner"
Lyman P. Harriman. 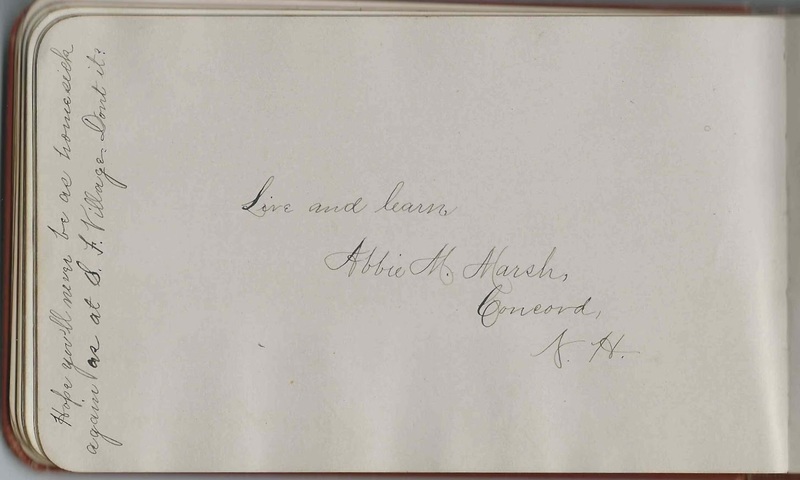 Lyman Patridge Harriman; his wife Anna Catherine (Cook) Harriman signed the right facing page. 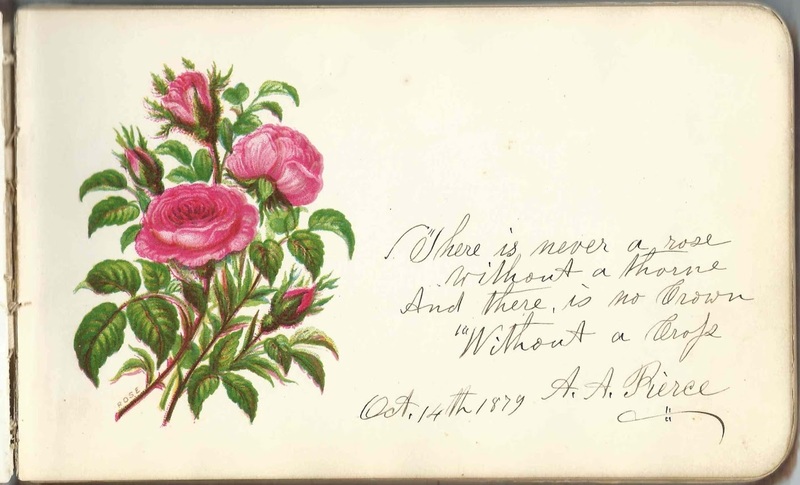 A. C. Harriman, signed at St. Johnsbury, Vermont, on November 9, 1878. She was Anna Catherine (Cook) Harriman, whose husband Lyman Patridge Harriman signed the left facing page. May L. Hodge of Lyndon, Vermont, signed on "2-7-1879"
? Humphrey, signed at E. St. Johnsbury, Vermont, on March 1, 1879. Initials could be F. P. or T. B. or ?? Carrie Olcott, signed at East St. Johnsbury, Vermont, on March 7, 1879; or Carrie of Olcott, Vermont. A. A. Pierce, signed on October 14, 1879; presumably Abel Allin Pierce, Etta Bell Pierce's father. Edna M. Pierce of Olcott, Vermont, signed on October 13, 1895. She was the daughter of Etta Bell's brother Edward Carlisle Pierce and wife Mary L. (Williams) Pierce. C. S. Pierce of Minneapolis, Minnesota, signed at East Barnet, Vermont, on March 3, 1885; "your little brother" He was Etta Bell's brother Charles Sumner Pierce, son of Abel Allin Pierce and Rosetta (Ayer) Pierce. C. A. Severance of St. Johnsbury, Vermont, signed on March 7, 1879. He was Chandler A. Severance, whose wife Sophronia M. (Chapman) Severance signed the right facing page. S. M. Severance of St. Johnsbury, Vermont, signed on March 7, 1878. She was Sophronia M. (Chapman) Severance, whose husband Chandler A. Severance signed the left facing page. 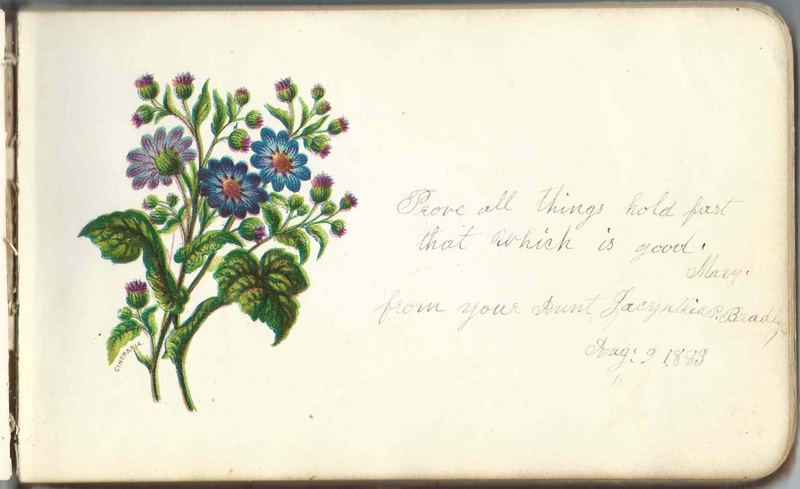 Mrs. J. Smith, signed at St. Johnsbury, Vermont, on February 14, 1882; middle initial might be W or G or T or ? 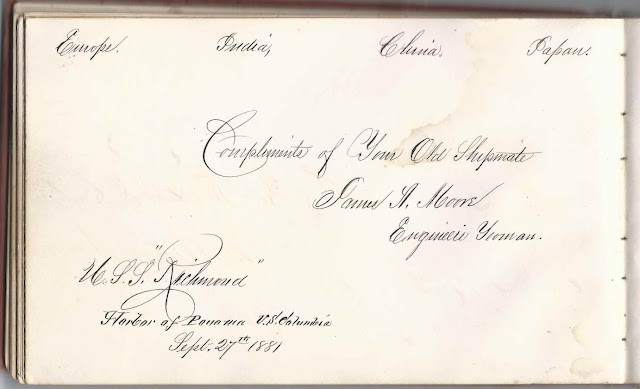 Charles D. Waite of St. Johnsbury, Vermont; his wife signed the right facing page. Mrs. Charles D. Waite of St. Johnsbury, Vermont, signed on August 5, 1879; her husband Charles D. Waite signed the left facing page. George S. Williams of St. Johnsbury, Vermont, signed on February 21, 1879. His wife Louisa (Willey) Williams signed the right facing page. Louisa Williams of St. Johnsbury, Vermont. She was Louisa (Willey) Williams, whose husband George S. Williams signed the left facing page. Nell M. Williams, signed at St. Johnsbury, Vermont, on October 7, 1878; called the album owner "sister". She was the daughter of signers George S. and Louisa (Willey) Williams; her sister Mary L. Williams married Etta Bell's brother, Edward Carlisle Pierce. 1886-1888 autograph album of Samuel Archibald Smith, "Archie", of West Wilton, New Hampshire, kept while he was a student at South Lancaster Academy at South Lancaster, Massachusetts. The Academy, founded in 1882 by Seventh-day Adventists, is still operating today. 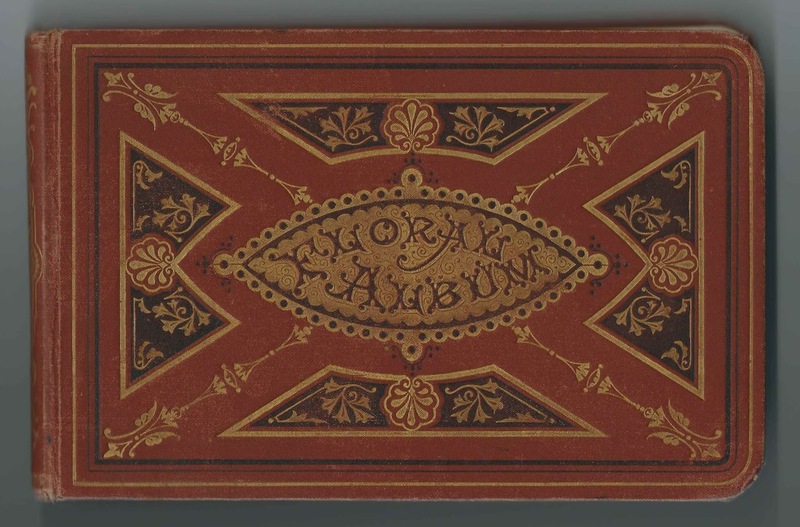 The album is approximately 6-1/4" x 3-3/4" and contains the sentiments of 59 of Archie's relatives, friends and South Lancaster Academy schoolmates. An alphabetical surname list and an alphabetical list of the signers, together with any personal information they offered, appear at the end of this post. Students came from many states, in addition to Massachusetts and New Hampshire. The album has illustrated pages interspersed throughout. Samuel Archibald Smith, "Archie", was born 27 November 1870 at Wilton, New Hampshire, the son of Samuel Wood Smith and Frances Cornelia (Jones) Smith. Archie had an older brother, Frederick Glazier Smith, born 12 December 1867 at Wilton, New Hampshire. 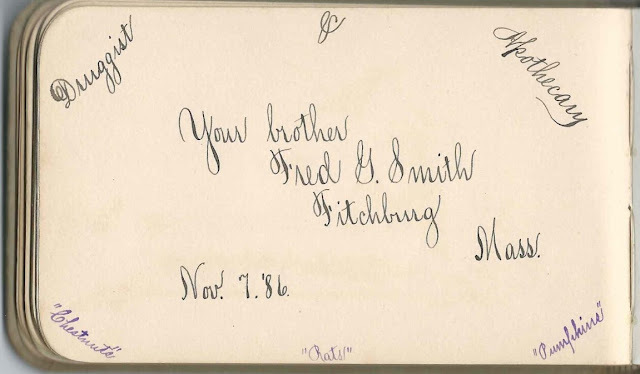 Fred, then living at Fitchburg, Massachusetts, inscribed a page in his brother's album on November 7, 1886. Among others, he wrote the words "Druggist" and "Apothecary". He may have been a druggist in 1886 or have been studying to be one. He became a physician and practiced at Somerville, Massachusetts. One of Archie's teachers at South Lancaster Academy, E. E. Miles, signed a page at South Lancaster, Massachusetts, on November 5, 1886. He was E. Edgar Miles. After South Lancaster Academy, I believe Archie went on to graduate from the University of Michigan in 1894. On September 6, 1898, Archie married Isabelle Morse Blackburn, daughter of Alexander and Margaret Elizabeth (Hall) Blackburn. Isabelle was born at Chicago, Illinois, on March 9, 1874. At the time of the 1900 Census, Archie and Isabelle were living at Elizabeth, New Jersey; Archie was working as a teacher. By 1910, they were still at Elizabeth, New Jersey, with four children; Archie was teaching at an academy. By 1920, the family of six was at living at Oyster Bay, New York; Isabelle's brother Alexander Maxwell Blackburn and his family were also living in the household. Archie was the principal at an academy, I think the Friends Academy, at Locust Valley on Long Island, New York. By 1930, Archie and Isabelle and their two youngest children, both daughters, were living at Glen Cove, New York. Archie was a principal and Isabelle, an assistant principal. Archie was a one-time principal at the Brooklyn Friends School at Brooklyn, New York and at the Pingry School. Walter R. Andrews of South Lancaster, Massachusetts, signed on February 20, 1888. He wrote "New Hampshire Boys", so perhaps his home was in New Hampshire, and he was at South Lancaster to attend South Lancaster Academy. C. A. Barnes of Hartland, Maine, signed at South Lancaster Academy, at South Lancaster, Massachusetts, on October 11, 1886. Presumably Cornell A. Barnes, son of Abraham and Abbie H. (Oakes) Barnes. Joel P. Bradford of Acushnet, Massachusetts, signed at South Lancaster Academy at South Lancaster, Massachusetts, on November 27, 1886. He was Archie's roommate. Bertha Butler of Worcester, Massachusetts, signed on April 14, 1886; presumably a student at South Lancaster Academy at South Lancaster, Massachusetts. B. A. Byron of Linneus, Maine, signed at South Lancaster Academy at South Lancaster, Massachusetts, on April 13, 1886 [or 1885 - there's a strikeover]. Presumably Birdsell A. Byron, son of George L. and Melissa Etta (Webber) Byron of Linneus, Maine. Written so that it shows correctly in a mirror: Sanford S. Edwards of Delaware, Ohio; presumably a student at South Lancaster Academy at South Lancaster, Massachusetts. Emma M. Farnsworth of South Lancaster, Massachusetts, signed on February 19, 1888 at South Lancaster Academy. Orvil O. Farnsworth of Washington, New Hampshire, signed at South Lancaster Academy at South Lancaster, Massachusetts, on November 1, 1886. Sara J. Hall, signed at South Lancaster Academy at South Lancaster, Massachusetts, on "4-1-1886"
Edgar Kelsey, signed at South Lancaster Academy at South Lancaster, Massachusetts, on April 4, 1886; Archie's schoolmate and fellow-compositor. Ada Marr. 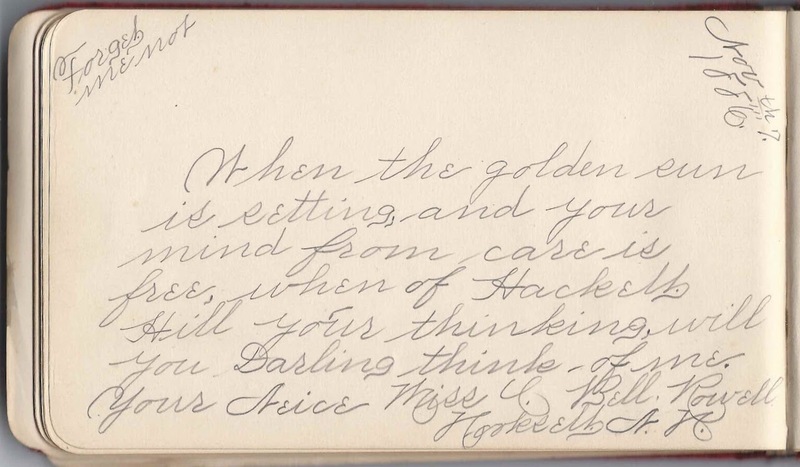 In addition to her regular sentiment, she wrote "I hope you will not always have to do dining room work." Presumably signed at South Lancaster Academy at South Lancaster, Massachusetts. George B. Mason of South Lancaster, Massachusetts, signed on April 14, 1886; Archie's schoolmate, presumably at South Lancaster Academy. G. F. Merry of Vineyard Haven, Massachusetts, signed at South Lancaster Academy at South Lancaster, Massachusetts; Archie's schoolmate. 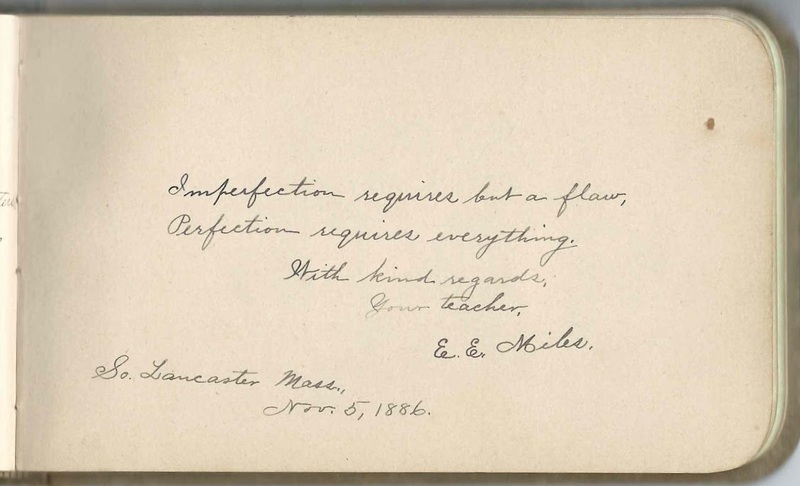 E. E. Miles, signed at South Lancaster, Massachusetts, on November 5, 1886; Archie's teacher. Presumably E. Edgar Miles. Edwin R. Palmer of West Charleston, Vermont, signed at South Lancaster, Massachusetts, on November 11, 1886, presumably at South Lancaster Academy. Charles A. Ramsey, signed at South Lancaster Academy, at South Lancaster, Massachusetts, on May 14, 1888. Called himself Archie's "brother", possibly in a fraternity or church. 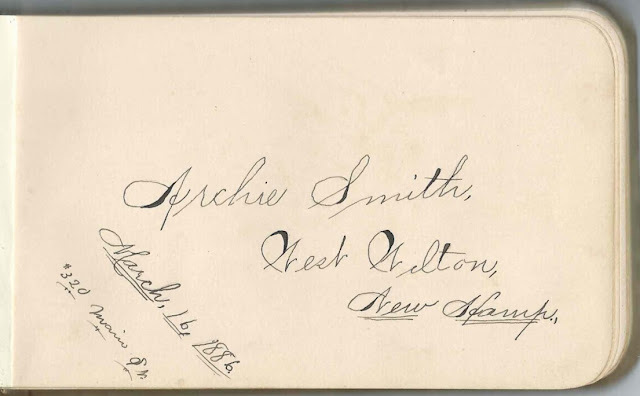 Archie Smith of West Wilton, New Hampshire, dated March 16, 1886. Album owner Samuel Archibald Smith, "Archie", who kept the album while he was a student at South Lancaster Academy at South Lancaster, Massachusetts. 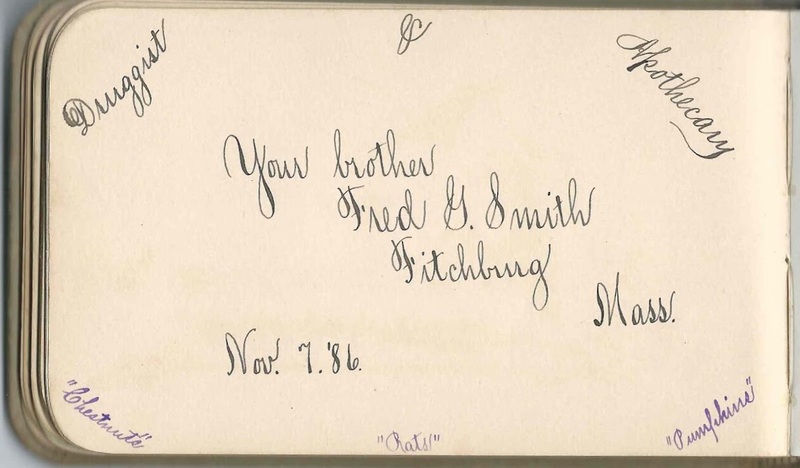 Fred G. Smith of Fitchburg, Massachusetts, signed on November 7, 1886; Archie's brother Frederick Glazier Smith. He wrote these words around the page: "Druggist" "Apothecary" "Chestnuts" "Pumpkins" "Rats". He may have been a druggist or wanted to be one, but he was also a physician at Somerville, Massachusetts. C. M. Snow of Bridgewater, Maine, signed at South Lancaster Academy at South Lancaster, Massachusetts, on March 16, 1886. Presumably Charles M. Snow. M. H. Thomas of Humphrey, New York, signed at South Lancaster, Massachusetts, on January 8, 1887, presumably at South Lancaster Academy. C. A. Townsend of No. 6 Church St., Rutland, Vermont, signed at South Lancaster, Massachusetts, presumably at South Lancaster Academy, on December 21, 1887. Edgar N. Washbond of 205 State Street, Albany, New York, signed at South Lancaster, Massachusetts, on "11-7-1886", presumably at South Lancaster Academy. 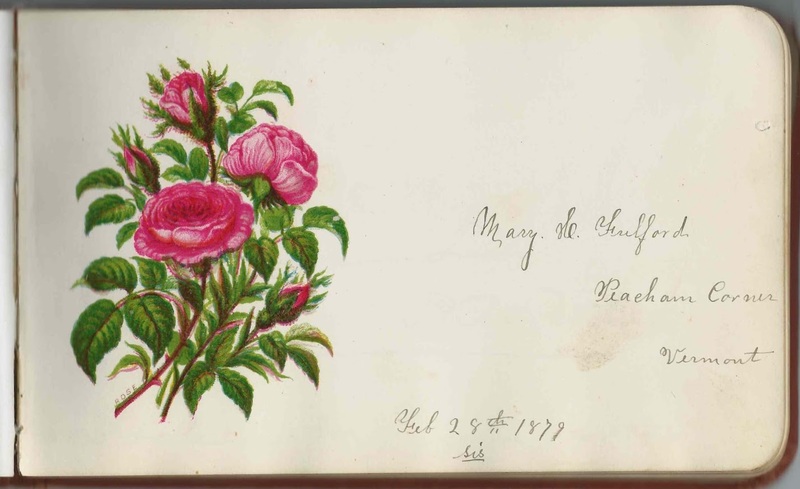 1878-1883 autograph album that was presented to Ellen Fulford of Littleton, New Hampshire, by her future husband Daniel Francis Huse at Christmas in 1878. Ellen used the same page to write a welcome to the future inscribers. 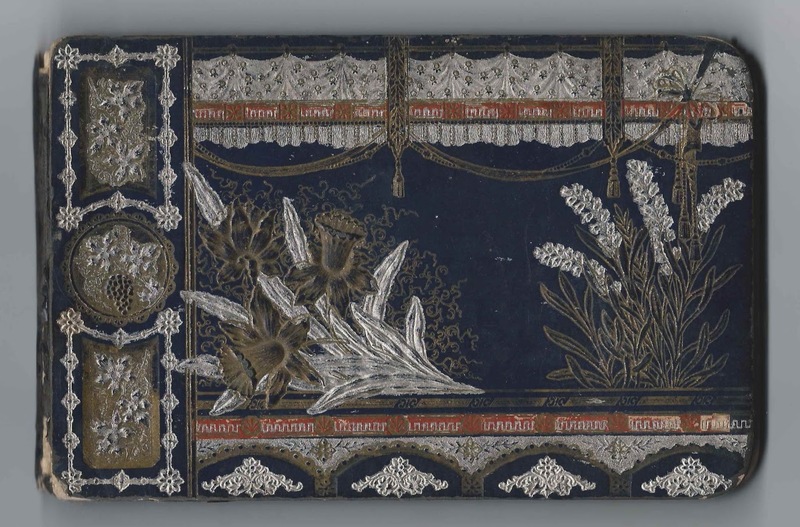 The album measures approximately 7-3/4" x 4-3/4" and contains the sentiments of 50 of Ellen's relatives, friends and schoolmates. An alphabetical surname list and an alphabetical list of the signers, together with any personal information they offered, appear at the end of this post. Ellen Fulford was born 27 January 1859 at Littleton, New Hampshire, the daughter of Eliphalet and Ruth Brown (Parker) Fulford. 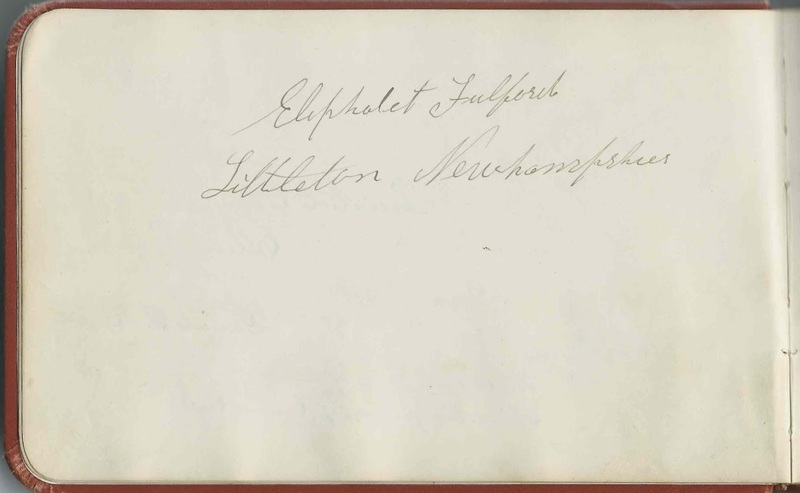 Eliphalet Fulford of Littleton, New Hampshire, inscribed a page in his daughter's album. Thanks to the generosity of a person who rescues orphan photographs: a Carte de Visite made at St. Johnsbury, Vermont, of Ellen and her parents. 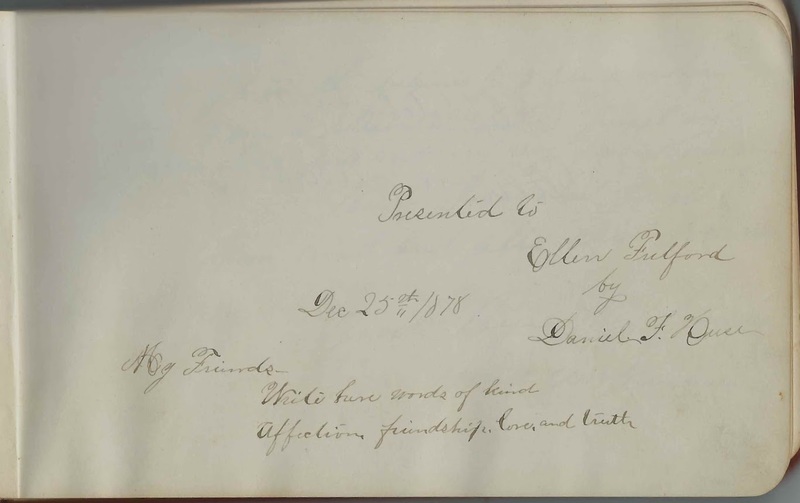 Ellen had several older brothers, but only one of them inscribed a page in her album. 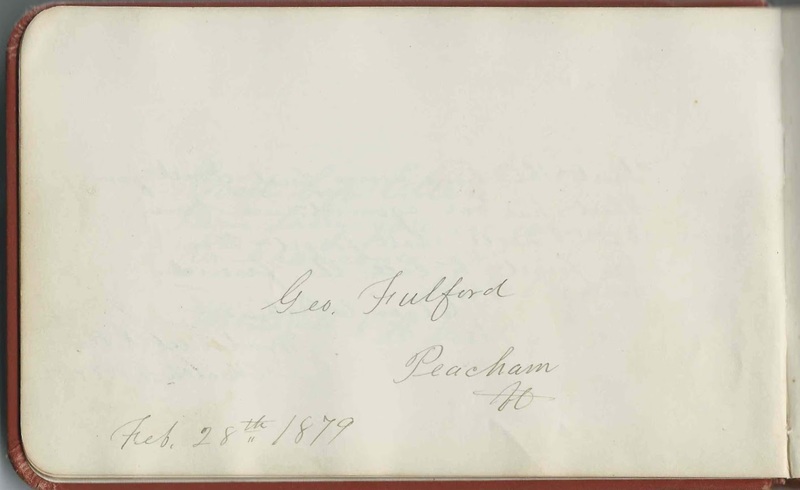 George Fulford, by then living at Peacham, Vermont, signed a page on February 28, 1879. His wife, Mary H. (Graham) Fulford, also signed a page. Some of the entries by Littleton, New Hampshire, folks appear to have been written in response to Ellen's imminent move to Franconia, New Hampshire, perhaps after her marriage to Daniel Francis Huse on November 4, 1879. Some were written after her move by Franconia, New Hampshire, folks. 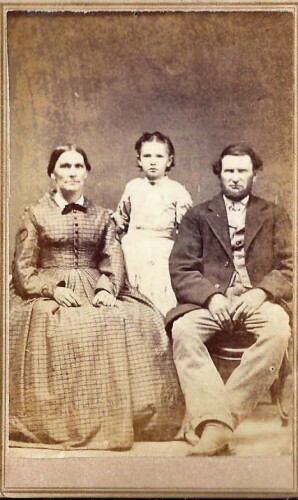 Abbie M. Marsh of Concord, New Hampshire, mentioned the homesickness that Ellen suffered after the move. As the map below shows, the distance between Littleton and Franconia is not great by modern standards, but it must have been a challenge in the 1870s and 1880s, especially during the winter season. Sadly, Ellen (Fulford) Huse died on 19 May 1888 at Littleton, New Hampshire. 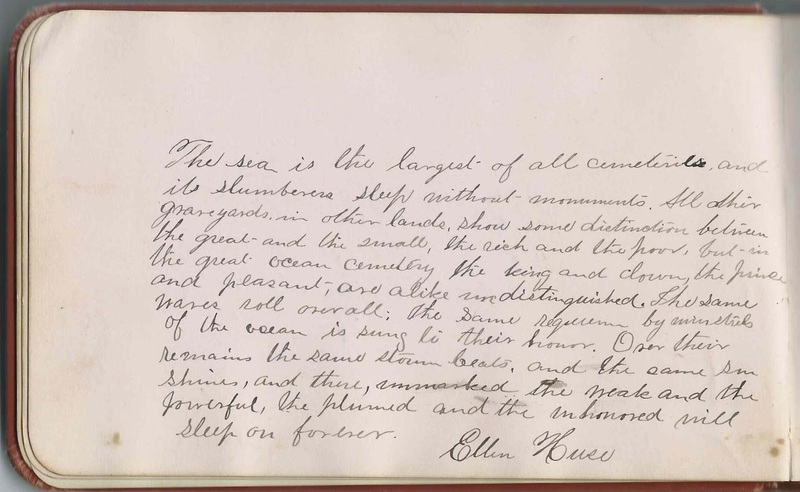 Ellen herself had inscribed a page in her album on the subject of the sea as a cemetery, where all were viewed the same, the rich, the poor, the famous, the unheralded. Perhaps she had suffered with illness for some years and knew that her life would be cut short. Daniel Francis Huse married Harriet Graves in 1889. He lived until 1940. Irena H. Bowman of Lower Waterford, Vermont, signed on January 31, 1879. She was Irene H. (Richardson) Bowman, wife of Edwin Bowman and daughter of Abial and Jane Richardson. Katie Collins of Boston, Massachusetts, signed "7-8-79"
George Fulford of Peacham, Vermont, signed on February 28, 1879; Ellen's older brother George Fulford, whose wife Mary H. (Graham) Fulford also signed a page in the album. Mary H. Fulford of Peacham Corner, Vermont, signed on February 28, 1879. She was Mary H. (Graham) Fulford, wife of Ellen's brother, signer George Fulford. Charles A. Glovier of Littleton, New Hampshire, signed on January 31, 1881; his wife Alma J. (Remick) Glovier signed the right facing page. Alma J. Glovier, signed at Littleton, New Hampshire, on January 31, 1881. She was Alma J. (Remick) Glovier, whose husband Charles A. Glovier signed the left facing page. Mr. and Mrs. P. S. Graham, signed on December 2, 1881. Presumably Mr. and Mrs. Percival Sobieski Graham. The page was also signed by May Robinson, but she may have been Mrs. Graham, adding her maiden name, for memory's sake. G. W. Guy of Littleton, New Hampshire, signed on March 1, 1886. Possibly George W. Guy. Mrs. Antonie Hoffman, signed at Franconia, New Hampshire, on August 22, 1879; her husband A. Hoffman signed the overleaf. 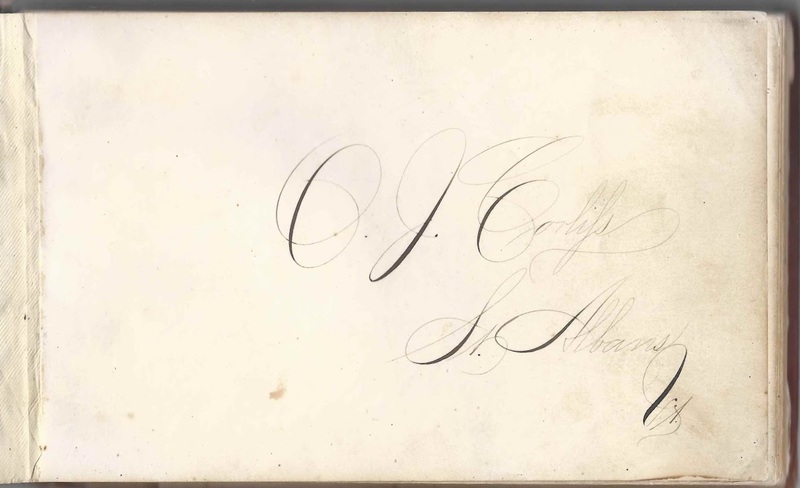 A. Hoffman, signed at Franconia, New Hampshire, on August 22, 1879; his wife signed the overleaf. R. I. Huntoon of Littleton, New Hampshire, signed on May 15, 1878. Presumably Richard I. Huntoon. Abbie M. Marsh of Concord, New Hampshire. "Hope you'll never be as homesick again as at S.F. Village"
H. W. Priest of Franconia, New Hampshire, signed on July 25, 1879. Perhaps Harry W. Priest. G. W. Ramsay of Woodsville, New Hampshire, signed on March 4, 1879. Perhaps George W. Ramsay. B. C. Richardson of Littleton, New Hampshire, signed on July 18, 1880. 1870s/1880s autograph album of Ozro Julius Corliss of Saint Albans, Vermont, kept mainly while he was a student at Barre Academy at Barre, Vermont, with a few from his service on the U.S.S. Richmond and a few from his years in Kansas. He left notes on a few pages indicating careers, marriages and deaths, though he was off on a few dates. Perhaps the album had come to light in his later years, and he was relying on his memory. There was more than one Ozro Julius or Julius Ozro in the Corliss family but fortunately I found a multi-page biography of an Ozro Julius Corliss in "A Biographical History of Central Kansas", Volume II, published in 1902. 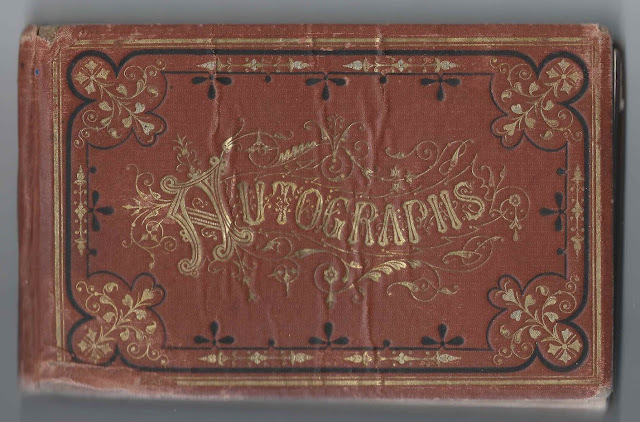 This Ozro was born in Vermont, attended Barre Academy, served in the U.S. Navy and moved to Kansas, so I feel confident that he was the owner of this autograph album. The article goes into some detail of his family history, military service and years in Kansas. Ozro Julius Corliss was born at Swanton, Vermont, on 12 April 1857, the son of John Rae Corliss and Lovica (Eaton) Corliss. 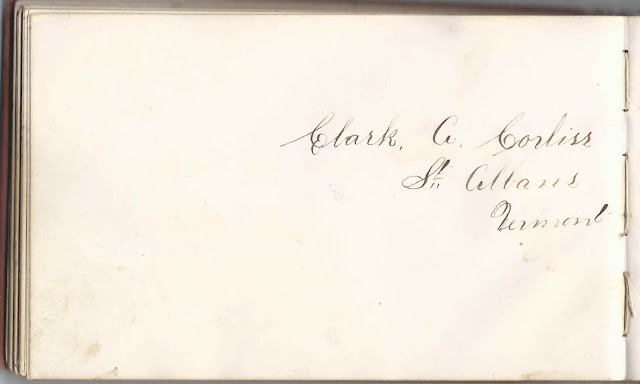 One of Ozro's brothers, Clark Alonzo Corliss of Saint Albans, Vermont, signed a page in the album. According to the biography, Ozro was at Barre Academy from the age of 16 to 19. A few of the faculty and many students at Barre Academy signed pages in the album, as did a few from Swanton Academy. The alphabetical list of Barre Academy students online at the Morgan Library of Ohio website was an enormous help in deciphering the identities of signers who used initials for their first and middle names. Jacob Shedd Spaulding was principal of Barre Academy from 1852 to 1880; his wife Mary W. (Taylor) Spaulding also taught there. They signed facing pages in the album in 1876. In the late 1880s, Barre Academy was renamed Spaulding High School in honor of Jacob Shedd Spaulding. 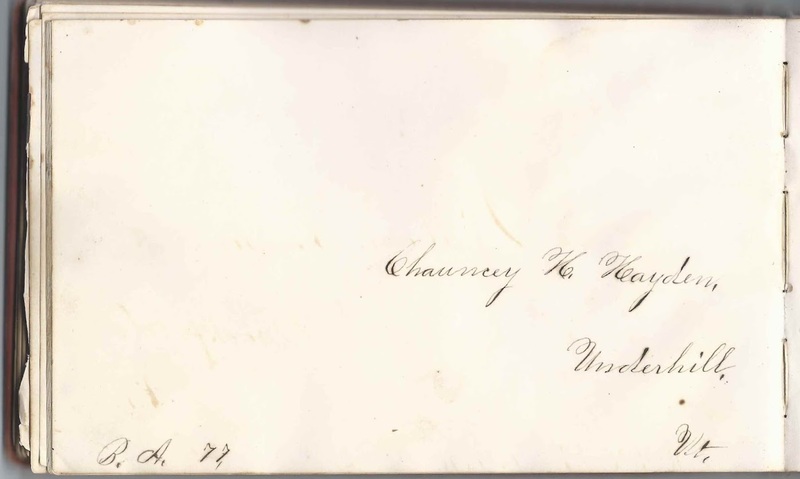 One of the Barre Academy students who signed a page, in 1877, was Chauncey Hoyt Hayden of Underhill, Vermont. He was the future husband of Mary Alice Lane, whose autograph album, in which Chauncey also signed, was featured in another post. After Barre Academy, Ozro worked at the home farm in Vermont before enlisting in the U.S. Navy in 1878 at the Charlestown Navy Yard at Boston, Massachusetts. His first ship was the U.S.S. Wabash; he was then transferred to the man-of-war U.S.S. Richmond and traveled around the world for the next three years. He was on the ship near Corsica when it was damaged during the Great Storm of 1879. He left the service in 1881. A fellow shipmate on the U.S.S. Richmond was Samuel A. Moore, Engineer Yeoman, who signed while the ship was at Panama on September 27, 1881. Ozro had been very careful with his money while in the service and had lent it out with interest over his tour so that he had a nest egg of over a thousand dollars when his tour ended. He went back to Vermont and, on April 12, 1882 at Saint Albans, married Udella Mary Dutton, daughter of Lucius and Mary (Keeler, according to the biography) Dutton. After a couple years, the couple moved to Sylvan Grove, Kansas, where they purchased the first of several farms they owned over the years. 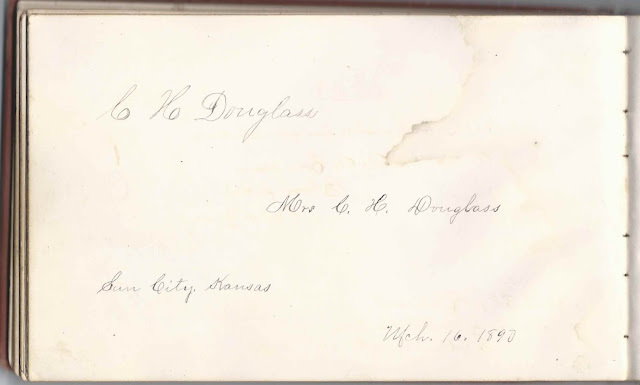 Ozro worked for a while as a druggist at Sun City, Kansas, which explains the several pages signed by Sun City, Kansas, residents, including that of Mr. and Mrs. C. H. Douglas, who signed shared page in 1890. They lived for a short while in Oklahoma before returning to Barber County, Kansas, where they purchased a fine farm; Ozro was involved in civic affairs. The couple had two sons, Clark Lucius Corliss and Bruce Ray Corliss. The biography mentioned that the sons were educated back East; they apparently stayed there or returned there at some point as Clark died in Connecticut and Bruce in Vermont, both after long lives. Left of facing pages entitled "Chums": Fred O. Allen of Westford, Vermont, B.B.H., signed on March 22, 1875. Fred Otis Allen, a student at Barre Academy. The right page has the inscription of Hermon Oliver Webster. George A. Allen of Westford, Vermont, signed at Barre, Vermont, on October 14, 1875. He was George Arthur Allen, a student at Barre Academy. Hattie M. Allen of South Hero, Vermont, signed at Barre Academy in 1876. She was Hattie Manda Allen and mentions that the owner was her brother, though it must have been a religious, social or in-law relationship. Frank B. Babcock of Northport, New York, on Long Island, signed at Barre Academy on April 17, 1875. Surname is Bailey, and I think the initials are G. W., signed at Barre Academy in 1876. Possibly George Whitefield Bailey of Greensboro, Vermont. George E. Bass of Williamstown, Vermont, signed at Barre, Vermont, on October 1, 1875. He was a student at Barre Academy. Ivers B. Batchelder of South Woodbury, Vermont, signed at Barre, Vermont, on April 17, 1875. Student at Barre Academy. Charles H. Beckett of Williamstown, Vermont, signed on September 28, 1875. Later note: "Clerk Serogate [Surrogate? ], N.Y. City N.Y." He was Charles Henry Beckett. Fred D. Beckley of Barre, Vermont, signed on November 10, 1875. He was Fred David Beckley, a student at Barre Academy. Julia Bradley of Fairfield, Vermont, signed at Barre Academy in the Spring of 76. Elroy Clark of North Hero, Vermont, signed on December 15, 1875 at Barre Academy. Later note: "Attorney for Denver & Rio Grande, Denver, Colo". Elroy N. Clark. Edmund W. Corey of Grand Isle, Vermont, signed at Barre Academy on October 14, 1875. He was Edmund Walworth Corey. Clark A. Corliss of St. Albans, Vermont; brother of album owner Ozro Julius Corliss. Alice Crane, signed on February 15, 1876. Later note: "Married Lelan Tupper, died in the 90s in Kan." She was Alice Eliza Crane who married Leland Ellis Tupper. Alice died in 1901. H. H. Cushman of Rochester, Vermont. He was Henry Herbert Cushman, a student at Barre Academy. Minnie E. Dickinson of Williamstown, Vermont, B.B.H., signed during the Spring Term, 1877. Student at Barre Academy. 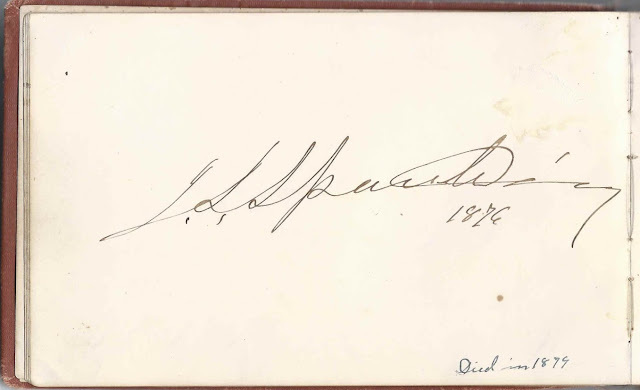 Willie W. Dinsmore of Alstead, New Hampshire, signed at Barre Academy on October 13, 1875. He was Willie Warner Dinsmore. J. W. Dodds of North Hero, Vermont, signed at Barre, Vermont, on April 2, 1874. James Watson Dodds, a student at Barre Academy. Emma J. Dodds of North Hero, Vermont, signed on March 12, 1876 at Barre Academy. Emma Jane Dodds. Mary C. Dodds of North Hero, Vermont, signed at Barre Academy on January 14, 1876. C. H. Douglas; shared the page with Mrs. C. H. Douglas who signed at Sun City, Kansas, on March 16, 1890. W. A. Downer of Rochester, Vermont, signed at Barre Academy on September 5, 1876. Willard A. Downer. 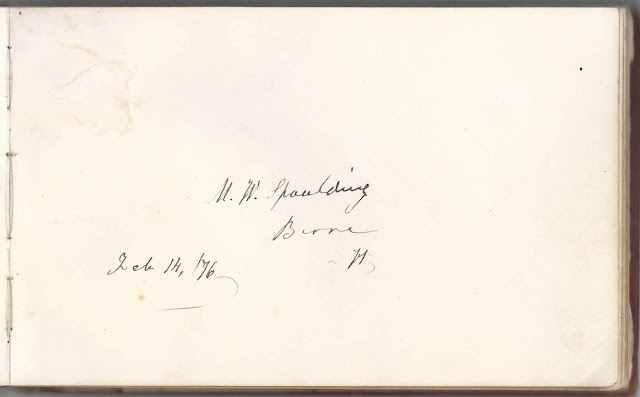 H. E. Ferrin of Hinesburgh, Vermont, signed at Barre Academy on September 25, 1875. He was Holman Ela Ferrin. Amy B. Fisk of Waitsfield, Vermont, signed at Barre, Vermont, on March 7, 1876. Teacher and Preceptress at Barre Academy. Hattie L. Flint of Barre, Vermont, signed at Barre Academy on April 17, 1875. She was Harriet Lillie Flint or Hattie Lillie Flint. Carrie H. Gile of West Hartford, Vermont, signed at B.B.H. on January 12, 1876. She was Carrie Hannah Gile, a student at Barre Academy. H. C. Gleason of Waitsfield, Vermont, signed at Barre Academy. He was Herbert Carlisle Gleason of Waitsfield, Vermont; shared the page with Arthur Brown Bisbee. Len K. Graves of Waterbury, Vermont, signed at Barre Academy in 1875. Leonard Knight Graves. W. A. Haynes of Natick, Massachusetts, signed at Barre Academy, '75. Presumably Willard Augustus Haynes. Left of facing pages entitled "Chums": A. H. Hazen of North Hero, Vermont, signed in the Spring term 1875. He was Arthur Herbert Hazen, a student at Barre Academy. The right facing page was signed by Darwin Pearl Kingsley. Walter S. Henry of Waterbury, Vermont, signed at Barre Academy on April 17, 1875. He was Walter Scott Henry. Arthur H. Hill of Isle La Mott, Vermont, signed on March 27, 1876 at B.A., Barre Academy, Class of '78. Arthur Henry Hill. Kitty E. House of Oconto, Wisconsin, signed at Barre Academy on March 28, 1876. She was Kitty Emily House. Hattie R. Hovey of Jericho Centre, Vermont, signed at Barre Academy on March 20, 1876. She was Harriet Rhoda Hovey. Written on the page upside down: W. D. Huntington of Rochester, Vermont, signed at Barre Academy on March 5, 1875. Later note: "Died in Rochester Vt about 1910". William Daniel Huntington. George A. Jewett of Swanton, Vermont. Later note: "Died about 84 or 5"
C. A. Ketchum of Barre, Vermont, signed on March 7, 1875. He was Charles A. Ketchum. Right of facing pages entitled "Chums": D. P. Kingsley of Alburgh Center, Vermont, signed at Barre Academy on March 24, 1875. Later note: "President N.Y. Life Insurance Co." The left facing page was signed by Arthur Herbert Hazen. H. A. Knight of North Hero, Vermont, signed at Barre Academy in the Fall Term of 1875. He was Homer Albert Knight. Dora E. Lockert, signed at Sun City, Kansas on March 7, 1891. Later note: "Died Chicago, Ill, August 1917"
W. B. Locklin of Fairfield, Vermont, signed at Barre, Vermont, on January 5, 1876. Wallace Byron Locklin, a student at Barre Academy. L. A. Merrill of Williamstown, Vermont. He was Leroy Albert Merrill, a student at Barre Academy. James A. Moore, Engineer Yeoman, signed on the U.S.S. Richmond at Panama on September 27, 1881. "Your Old Shipmate" "Europe, India, China, Japan"
W. C. Morris of Rochester, Vermont, signed at Barre Academy during the Fall Term, on October 22, 1875. He was Wilson Cooper Morris. O. W. Peck of Montgomery, Vermont, signed at Barre Academy on March 4, 1876. Presumably Oscar Wait Peck. Helen Perrin of Berlin, Vermont, signed at Barre Academy on March 22, 1876. J. E. Rice of Westford, Vermont, signed at Barre Academy during the Fall Term of 1874. Possibly John E. Rice. Annie May Richardson of Leavenworth, Kansas, signed at Barre Academy, Class of 1876. Emma H. Robinson of South Hero, Vermont, signed at Barre Academy in 1876. She was Emma Harriet Robinson. Edmund Seymour of Saint Albans, Vermont, signed at Barre Academy in 1875. W. D. Simonds of Roxbury, Vermont, signed in November 1875 at Barre Academy. Class of 1876. Presumably William Day Simonds who would go on to Amherst College in the fall of 1876. J. S. Spaulding, signed in 1876. Added note: "Died in 1879". Jacob Shedd Spaulding, principal of Barre Academy at Barre, Vermont; his wife Mary W. (Taylor) Spaulding of Barre, Vermont, signed the right facing page. M. W. Spaulding of Barre, Vermont, signed on February 14, 1876. Mary W. (Taylor) Spaulding, whose husband Jacob S. Spaulding signed the left facing page. She was a teacher at Barre Academy. Wendell P. Stafford of Barre, Vermont, signed on October 27, 1875, Class of 1877. Later note: "Judge Supreme Court Dist. Columbia" Wendell Phillips Stafford, a student at Barre Academy. W. M. Stiles of Montgomery Center, Vermont, signed on January 4, 1876 at Barre Academy. He was William Miller Stiles. D. R. Story of North Fairfax, Vermont, B.B.H. No. 12. Later note: "Died several years ago." He was Daniel Richardson Story, a student at Barre Academy. G. T. Swasey of Waterbury, Vermont, signed at Barre Academy in March 1875; "your old schoolfellow". George Truman Swasey. Emily S. Townsend of Barre, Vermont, signed on February 26, 1876. Late note: "Died about 1879 or 80". Ella M. Townsend of Barre, Vermont. She was Ella Mary Townsend, a student at Barre Academy. Leland E. Tupper of Bakersfield, Vermont. Leland Ellis Tupper, a student at Barre Academy. Fred S. Tupper of Bakersfield, Vermont. Later note: "Died Fairfield, Vt., about 1915". He was Frederick Simon Tupper. Right of facing pages entitled "Chums": Hermon O. Webster of Alstead, New Hampshire, B.B.H., signed on March 22, 1875. He was Hermon Oliver Webster, a student at Barre Academy. The left facing page was signed by Fred Otis Allen. Carrie M. Wheelock, Class of 1877. She was Carrie Mandana Wheelock of Barre, Vermont. J. F. White of Lonsdale, Rhode Island; not sure of initials. Evelyn D. Whittemore of Northfield, Vermont, signed at Barre Academy on February 15, 1876. She was Evelyn Dorcas Whittemore. L. D. Whittemore of Northfield, Vermont, signed at Barre Academy on April 16, 1875. He was Luther Denny Whittemore. T. C. Wright of Waterbury, Vermont, signed at Barre Academy on March 25, 1875. Tillman Christopher Wright. 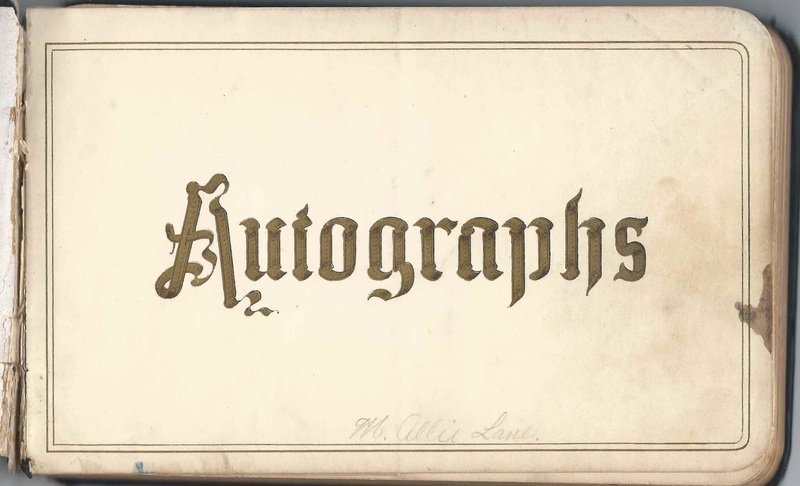 1882-1888 autograph album of Mary Alice Lane, "Allie", of Underhill, Vermont. The album contains the sentiments of many students at Essex Classical Institute at Essex, Vermont, and several of people associated with the Boston Farm and Trade School on Thompson Island in the harbor of Boston, Massachusetts. The University of Massachusetts at Boston has an archive of Boston Farm and Trade School items, including some of the newsletters, "The Beacon", from a later era. On the page below, Allie directed a message to future inscribers in her album. The album measures approximately 7-3/4" x 5" and contains the sentiments of 96 of Allie's relatives, schoolmates, friends and possibly teachers. An alphabetical surname list and alphabetical list of the signers, together with any personal information they offered, appear at the end of this post. Mary Alice Lane, "Allie", was born August 15, 1862 at Underhill, Vermont, the daughter of Asa Liscum Lane and Mary Arretta (Lee) Lane, who were Jericho, Vermont, natives. They signed facing pages in the album a year apart and gave their birth dates: July 24, 1817 at Jericho, Vermont, for Asa, and October 8, 1816 for Mary. Allie had, I believe, five siblings, three of whom signed pages in her album. They were Andalucia Orrilla Lane, "Lucia"; Olive Lovina Lane; and Edmund Conde Lane. Her sister Phebe Sophia Lane did not sign a page in the album, but her husband Theron Howard Porter did. They were married on November 25, 1880, earlier than any dated pages in the album. On November 25, 1886 in Vermont, Mary Alice Lane married educator Chauncey Hoyt Hayden, son of James and Sarah Freelove (Morse) Hayden. They settled at Jericho, Vermont, and six children, one of whom, a daughter, died young. Chauncey co-edited the History of Jericho, Vermont, published in 1916, which contains information on the Lane and Hayden families, and on his own family in particular. Because the list of signers is so long, there's no room for many additional images in the album. A couple, however, stand out. One is the page signed by W. Homer Rockwood, who signed his page at Underhill, Vermont, on February 14, 1885 and included a sketch entitled "Drugs" with an apothecary working mortar and pestle. I believe he was Homer Wilkins Rockwood who later became a druggist. 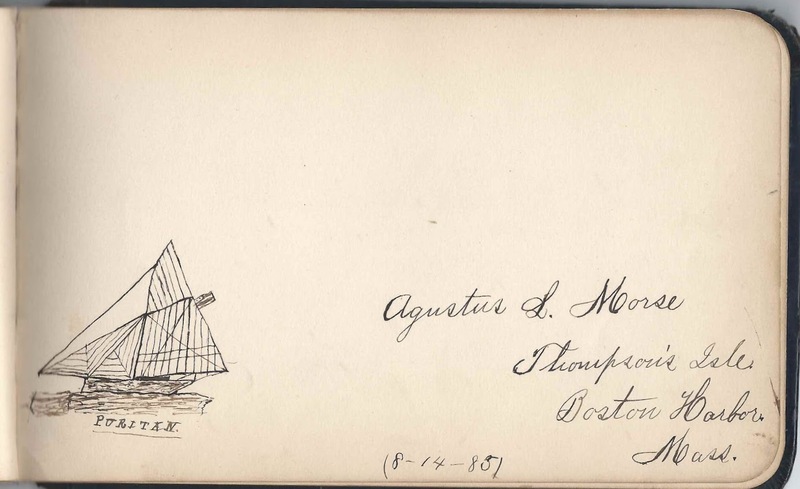 The other page I found so interesting was that signed by Agustus L. Morse at Thompson Island in Boston harbor, on August 14, 1885. He sketched the vessel "Puritan", which was the means of transportation from the island to Kelly's Landing in South Boston. The "Puritan" name lived on through at least 5 vessels. Agustus was the son of John R. Morse, teacher and bandleader at the Boston Farm and Trade School and author of "History of the Farm School Band". John R. Morse, his wife Sarah and three other children also signed in the album; refer to the list of signers below. C. C. Abbott of Underhill, Vermont, signed on March 7, 1885 "St. Patricks day in the afternoon"
Bertha Atherton of Essex, Vermont, signed on April 24, 1883 "Our trip to Brigham Hill"
Theodore L. Brown, signed on October 26, 1885 at Boston, Massachusetts. E.C.I., presumably Essex Classical Institute. J. D. Buker of Pleasant Valley, Vermont, signed January 23, 1884. He also stamped the page: "Z. D. Buker, P.M." Hide merchant Zenas D. Buker, who was postmaster as Pleasant valley, Vermont, in 1884. His sister Aura E. Buker also signed a page. 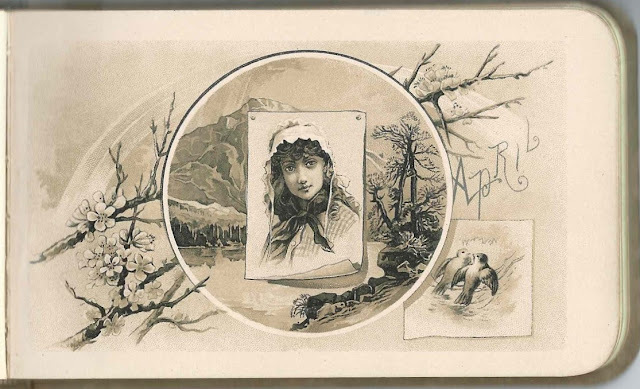 Aura E. Buker of Pleasant Valley, Vermont, signed on January 22, 1884. Sister of signer Zenas D. Buker. Laura Duffey of Pleasant Valley, Vermont, signed on "1-2-1884"
Charles Edwards or Charles Edward ?, signed at Thompson Island in Boston Harbor on February 12, 1886. 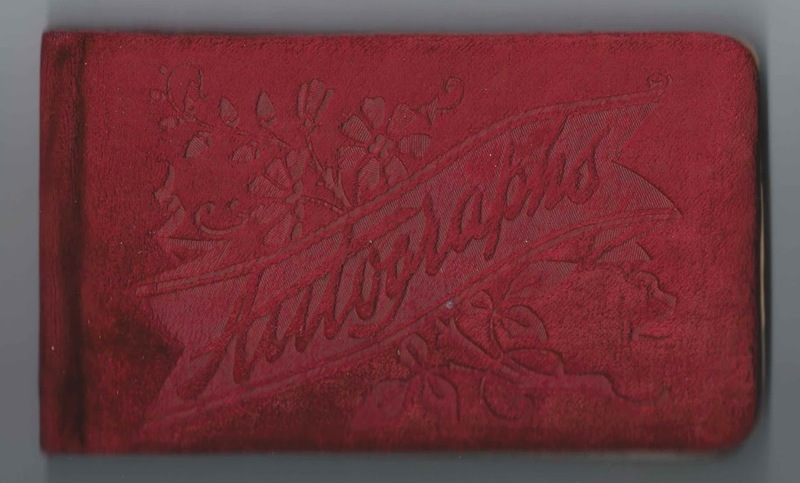 Amelia Ellsworth, signed on February 22, 1884; shared the page with Walter H. Ellsworth. Amelia was Amelia (Chapman) Ellsworth, Walter's paternal grandmother. Her husband Martin Ellsworth signed the right facing page. Martin Ellsworth of Cambridge, Vermont, signed on February 22, 1884. 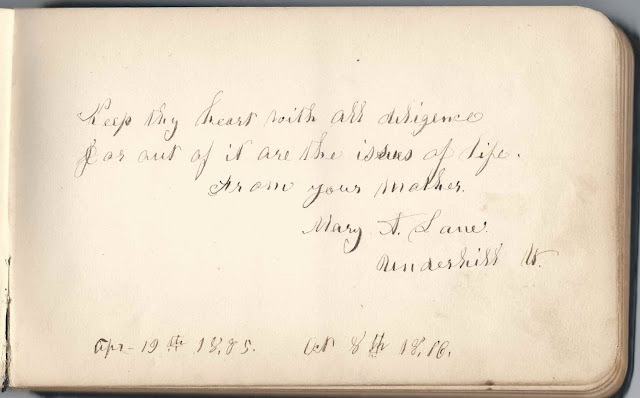 His wife, Amelia (Chapman) Ellsworth, and grandson, Walter Haynes Ellsworth, signed the left facing page. Sadie M. Elrick of West Berkshire, Vermont, signed at E.C.I. on November 10, 1888. Presumably Essex Classical Institute. Chauncey H. Hayden of Underhill, Vermont, signed on April 7, 1883. Chauncey Hoyt Hayden would become Allie's husband on November 25, 1886 at Jericho, Vermont. Frank Jackson of Underhill, Vermont, signed on March 3, 1883; middle initial might be S or L or ? Charles Jones of Boston, Massachusetts, signed on January 7, 1886. "You're a dumpling"
M. Allie Lane, [she wrote My Allie Lane]signed on February 4, 1883. She was Mary Alice Lane, "Allie", owner of the album. She's requesting friends to leave a token of remembrance in her album. 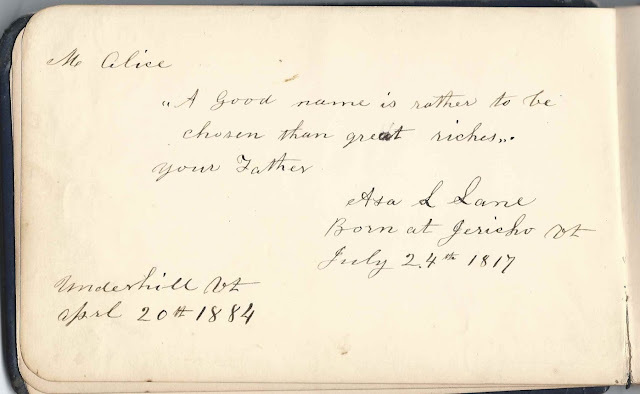 Asa L. Lane, signed at Underhill, Vermont, on April 20, 1884; "your Father". In addition to his sentiment, Asa Liscum Lane wrote: "Born at Jericho, Vt., July 24th 1817". His wife Mary Auretta (Lee) Lane signed the right facing page. Mary A. Lane of Underhill, Vermont, signed on April 19, 1885; "your mother". Mary Auretta (Lee) Lane added her birthdate: "Oct 8th 1816". Her husband Asa Liscum Lane signed the left facing page. Olive L. Lane of Underhill, Vermont, signed at Boston Harbor on June 19, 1885. Olive Lovina Lane, Allie's sister. Their brother Edmund Conde Lane signed the right facing page. Edmund C. Lane, signed on August 27, 1883. Allie's brother Edmund Conde Lane. Their sister Olive Lovina Lane signed the left facing page. He later lived at Omaha, Nebraska, where he had a law practice. Lizzie A. MacGibbon of Essex, Vermont, signed on February 23, 1883 at E.C.I., presumably Essex Classical Institute. "Lemons are good for the voice - Lyceum Evening Feb 7"
Edwin L. Marshall, Farm School, Boston, Massachusetts, signed on February 11, 1886; presumably the Farm School at Thompson Island in Boston harbor. Agustus L. Morse of Thompson's Isle in Boston Harbor, Massachusetts, signed on August 14, 1885. He drew a sketch of the vessel "Puritan". His parents and siblings also signed in the album. Ruth J. Morse of Thompson's Island, Boston, Massachusetts, G.H.S. '86; shared the page with her brother Norman Morse and sister Mabel S. Morse. Their father was a principal, teacher and band leader at the Boston Farm and Trade School. Mabel S. Morse, signed on August 14, 1885; shared the page with her brother Norman Morse and her sister Ruth J. Morse. Their father was a principal, teacher and band leader at the Boston Farm and Trade School. Sarah J. Morse; shared the page with her husband John R. Morse. John R. Morse. Signed at Thompson's Island in Boston Harbor, on August 13, 1885. John R. Morse was a principal, teacher and bandleader at the Boston Farm School on Thompson Island. He also wrote the "History of the Farm School Band" He shared the page with his wife Sarah J. Morse. Julia E. Moulton of Jericho, Vermont. Someone later wrote: "1837, 1904 Feb. 19". She may have been Julia E. (Morse) Moulton, wife of William F. Moulton, whom she married in 1861. 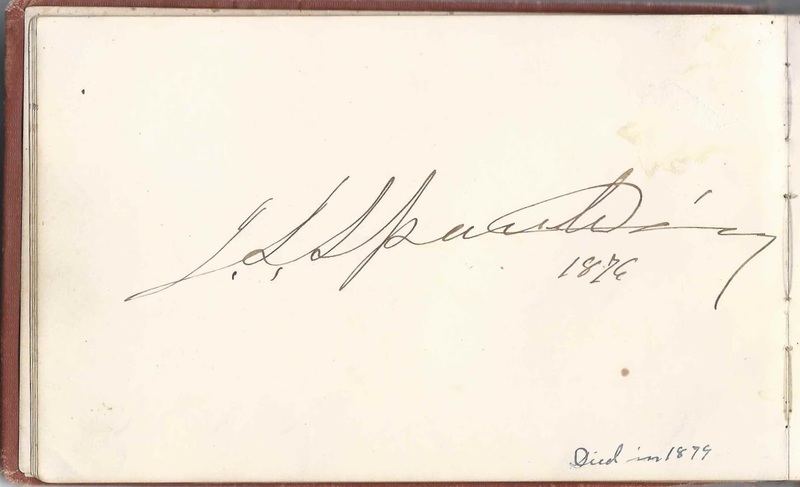 J. Partridge of Sebago, Maine, signed on "5-3-1885". He may have been Joseph Partridge, as an Abbie F. Partridge of Sebago signed another page, and she was presumably Abbie F. (Whitney) Partridge, married to Joseph Partridge. 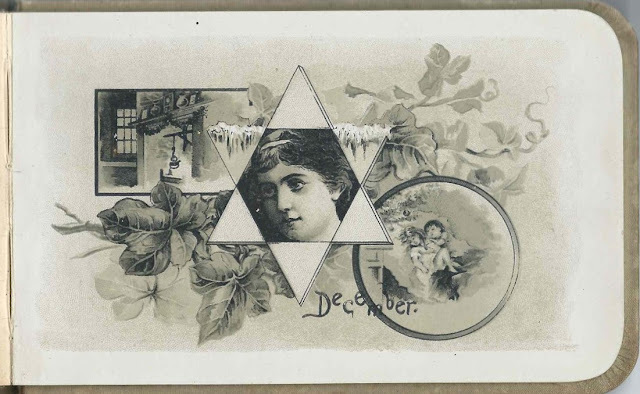 Abbie F. Partridge of Sebago, Maine, signed on December 26, 1885. Presumably Abbie F. (Whitney) Partridge, wife of Joseph Partridge, who may have been the J. Partridge of Sebago, Maine, who signed another page in the album. Theron H. Porter of Hyde Park, Vermont, signed on "3/11/83"; Allie's brother-in-law Theron Howard Porter, married to her sister Phebe Sophia (Lane) Porter. W. ? Rockwood of Underhill, Vermont, signed on February 14, 1885. Drew a sketch of an apothecary; "Drugs". Middle name might be Homer. There was a Homer Wilkins Rockwood, born July 15, 1861 at Jericho, Vermont, who went into the apothecary business, so this must be a case of switched first and middle names. Albert Edson Spencer at the Farm School on Thompson Island at Boston, Massachusetts, signed on "2-8-1886"
Elmer E. Vaughan of Hyde Park, Vermont, signed on "2/7/85"
Lettie Whitcomb of Underhill, Vermont, signed on April 8, 1885; middle initial could be P or C or ? 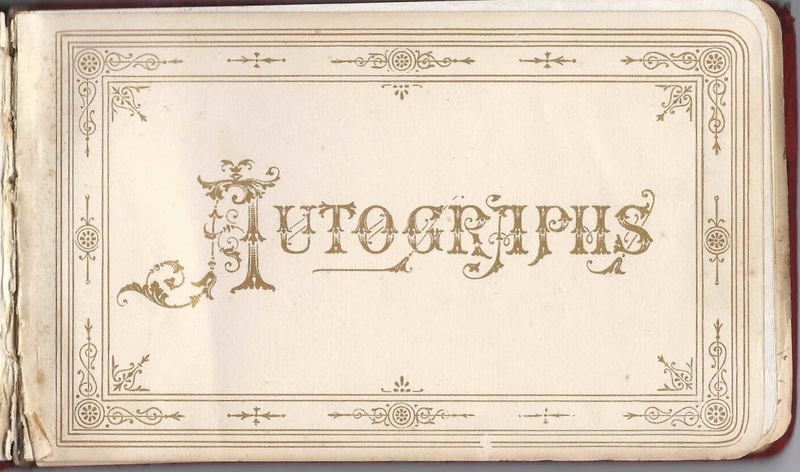 1888-1901 autograph album with signers mostly from Hooksett, New Hampshire. Many members of the Rowell and Crooker families signed pages in the album. It's likely that the album belonged to one of them. 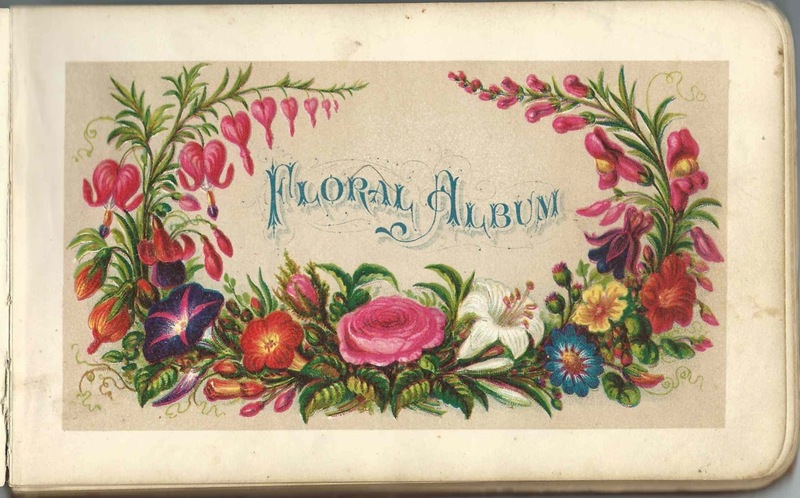 The album measures approximately 7-1/4" x 4" and contains the sentiments of 30 people. An alphabetical surname list and an alphabetical list of the signers, together with any information they offered, appear at the end of this post. One signer, Jennie Crooker, called herself the album owner's sister, which could have meant sister or sister-in-law. Jennie was Jane (Russell) Rowell, married to Charles H. Rowell, son of Amos and Mary Edith (Davis) Rowell. It's possible that Jennie was the daughter of William and Sarah (Shannon) Russell of Andover, Massachusetts, but I'd like confirmation of that. I don't know if Jennie had siblings. Charles had 7 siblings, one of whom may have been the album owner. Charles and Jennie of Hooksett, New Hampshire, inscribed facing page son December 1, 1886. Another signer, C. Bell Rowell of Hooksett, New Hampshire, signed a page on November 7, 1886 and called herself the album owner's niece. Fittingly, Charles H. Rowell and Jennie (Russell) Rowell had a daughter Clara Bell Rowell. Bell mentioned Hackett Hill in Hooksett, which is presumably where Charles and Jennie and family lived. 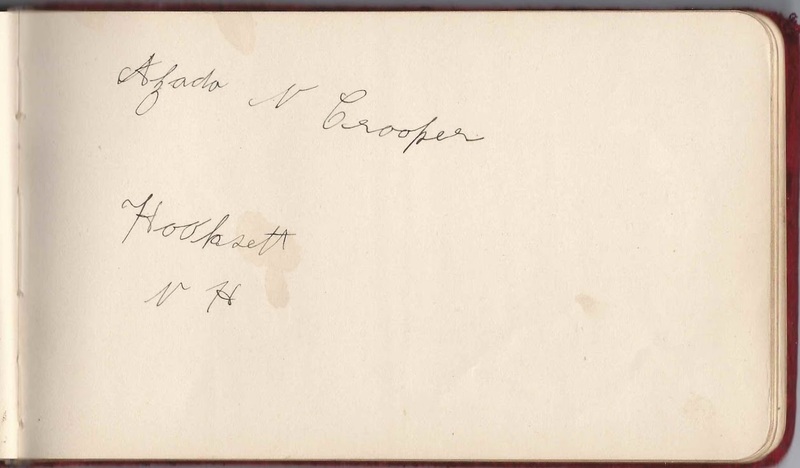 Charles' sister Frances S. (Rowell) Crooker, first wife of Philip E. Crooker, signed the first page in the album, on January 23, 1886. Whether she was indicating ownership of the album or just happened to be the first person to sign in it, I don't know, but the album continued on until 1901. If it had belonged to Frances, who died in 1894, then someone else must have taken it over. Charles' sister Ida May (Rowell) Gage, wife of Horace Putney Gage, did not sign a page in the album, but her two children, Mary Gage and Arthur Horace Gage, did. Perhaps the album belonged to Ida, though neither child mentioned a relationship. Charles' sister Annie Bell Rowell, who married Leroy H. Elliott in 1873, did not sign a page in the album. She lived until 1917 and could have been the album owner. Charles' brother Clinton M. Rowell did not sign a page in the album, so it's possible the album belonged to him. Charles' sister Myrtie G. Rowell of Hooksett, New Hampshire, signed a page on March 27, 1886, so it would seem the album was not hers. She would marry Arthur Dennison Brown. 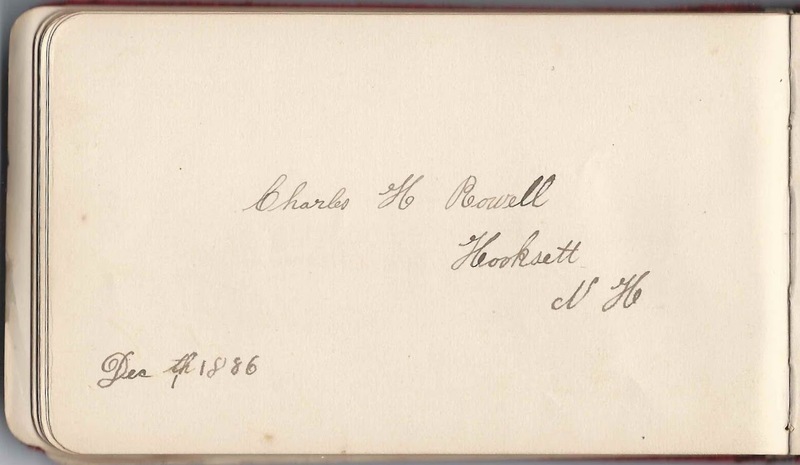 I'm presuming that the S. B. Rowell of Hooksett, New Hampshire, who signed a page on June 27, 1887, was Charles' brother Simeon B. Rowell, so it would seem the album was not his. 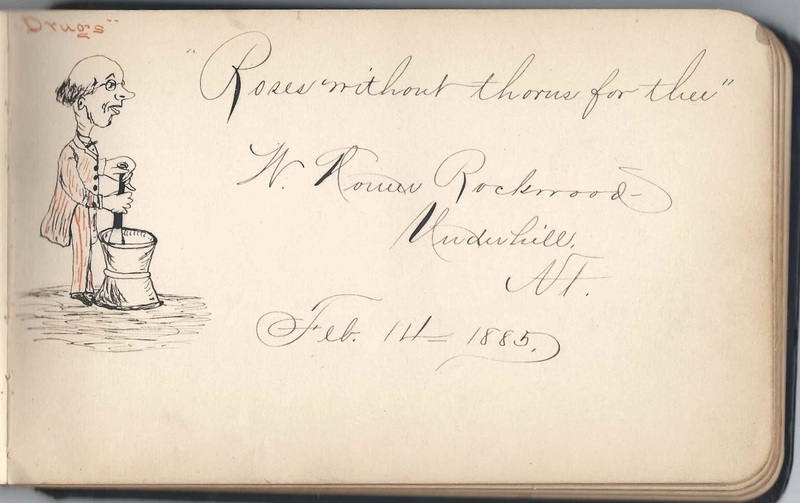 Charles' sister Nellie M. Rowell did not sign a page in the album, but her husband, Howard W. Wommack of Hooksett, New Hampshire, signed a page on January 27, 1900. Nellie lived until 1911, so it's possible the album belonged to her. If you have a theory as to the owner of the album, please leave a comment or contact me directly. Thanks! 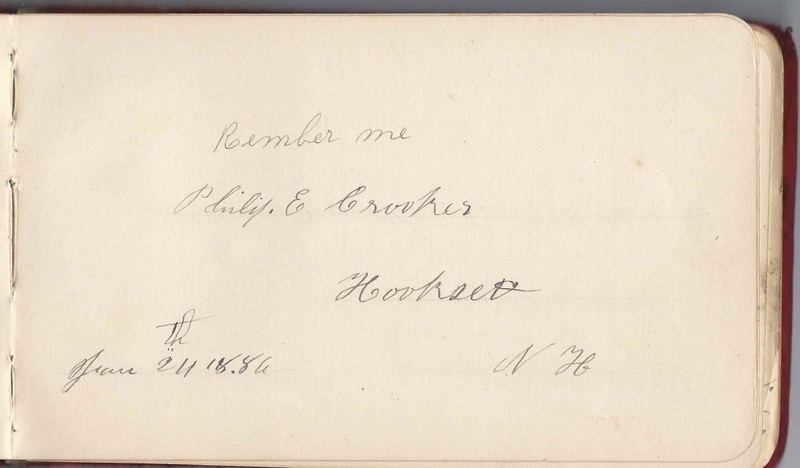 Frances S. (Rowell) Crooker's husband Philip E. Crooker of Hooksett, New Hampshire, a Civil War veteran, signed a page in the album on January 24, 1886, a day after his wife signed. As noted above, Frances S. (Rowell) Crooker died in 1894. On September 4, 1899, Philip married Alzada N. Locke, who signed a page in the album. Alazda was 15 years old. An article in the October 16, 1899 issue of the Fitchburg Sentinel mentions that Alzada's father, Fred Locke, caused a disturbance at the newlyweds' household; what precipitated this act can only be surmised. Alzada and Philip eventually divorced. Philip married Effie Florence (Sherman) Foote on December 5, 1910; Alzada had married Edwin Aldrich of Laconia, New Hampshire, in 1907. Please refer to the list below for more members of the Rowell and Crooker families. If you have a theory as to the identity of the album owner, or information on any of the signers listed below, please leave a comment or contact me directly. 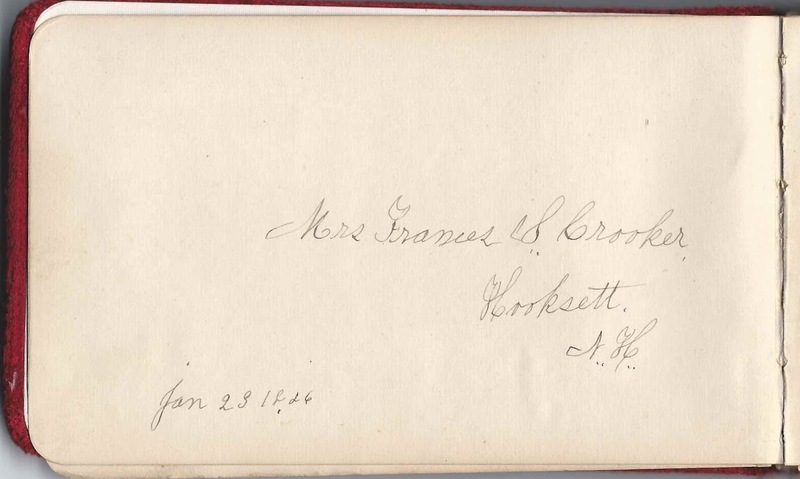 Mrs. Frances S. Crooker of Hooksett, New Hampshire, signed on January 23, 1886. She was Frances S. (Rowell) Crooker, first wife of Philip E. Crooker; she died in 1894. Philip E. Crooker of Hooksett, New Hampshire, signed on January 24, 1886. He would marry signer Frances (Rowell) Crooker in 1869. Alzada N. Crooker of Hooksett, New Hampshire. She was Alzada N. (Locke) Crooker, daughter of Fred A. and Loretta J. (Foote) Locke, who became the second wife of Philip E. Crooker in 1899. They divorced, and Alzada later married Edwin Aldrich of Laconia, New Hampshire, in 1907. Arthur H. Gage of Hooksett, New Hampshire. Either this same Arthur H. Gage or a relative signed another page in 1900. Arthur H. Gage of Hooksett, New Hampshire, signed on June 10, 1900; he may have been the Arthur H. Gage who signed another, undated, page. Effie M. Megin of Hooksett, New Hampshire, signed on August 23, 1899. She would marry Willie R. Loud on 30 June 1900 at Manchester, New Hampshire. Miss C. Bell Rowell of Hooksett, New Hampshire, signed on November 7, 1886; album owner's niece. She was Clara Bell Rowell, daughter of Charles H. Rowell and Jennie (Russell) Rowell. Charles H. Rowell of Hooksett, New Hampshire, signed on December 1, 1886. It was presumably his wife Jane (Russell) Rowell, "Jennie", who signed the right facing page. Jennie Rowell of Hooksett, New Hampshire, signed on December 1, 1886. Called herself the album owner's sister. 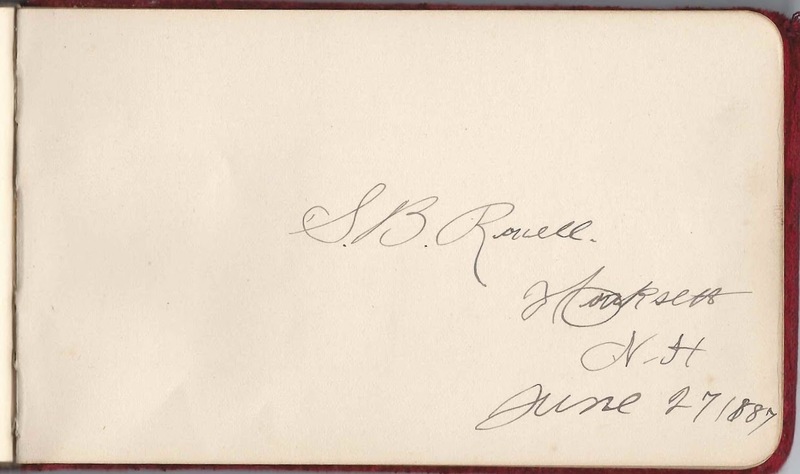 Presumably Jane (Russell) Rowell, "Jennie", wife of signer Charles H. Rowell, who signed the left facing page.